The Samutprakarn Crocodile Farm and Zoo is located 10km out from and on the outskirts of Bangkok and not too easy for the casual tourist to Thailand to reach unless they visit with a scheduled tour. A taxi is not that expensive and is probably the best choice as it gives you a bit of freedom along with the opportunity to stop and look at other sites along the way. 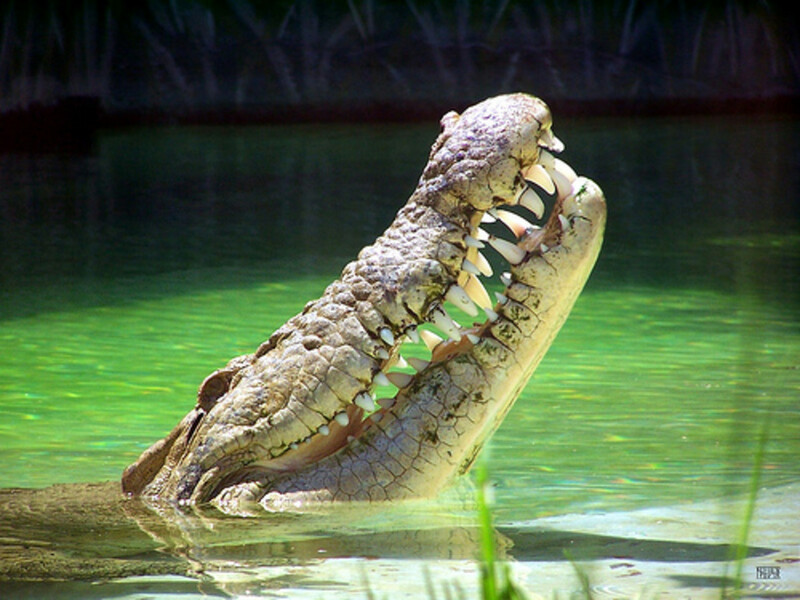 The crococodile farm claims to be the largest in the world (founded in 1950) and to have the largest number of crocodiles and to be 'world renowned'. It may well be all or some of these but it is a 'tacky' place and will leave a bad taste in the mouth of the zoo professional. It is interesting though and well worth visiting for the good bits. They do apparently have genuine conservation involvement and are actually involved in research. This is one of a series of zoo reports that was actually included within my travel journal ‘The Itinerant ZooKeeper’. Initially I started to extract the zoo data but found the reading was diminished by it. So look on it as a zoo/travelogue. The only major edits I have done is a little censoring and to remove the Casanova exploits. 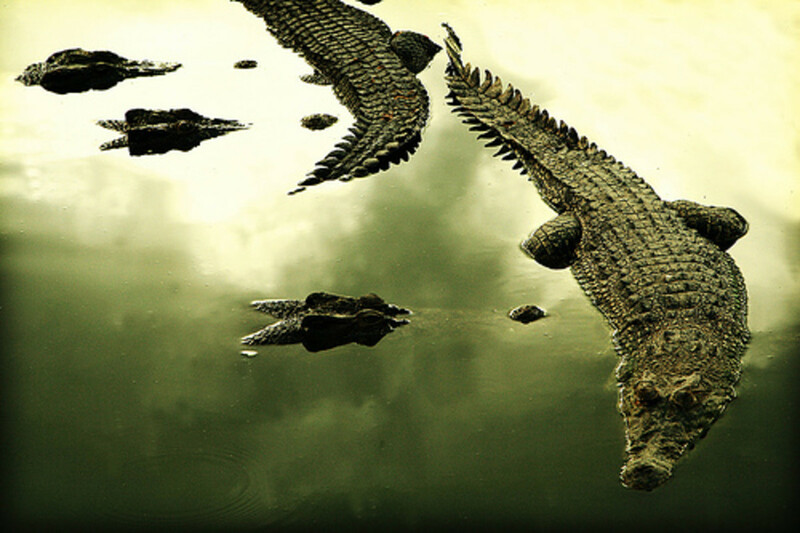 Within two hours drive of Bangkok there are two Crocodile Farms. Both do shows, both have elephants (in fact one has crocodiles and elephants and the other, elephants and crocodiles) and are fairly close to each other. Without a little bit of research it would be easy to end up at one thinking you were at the other. I chose to visit the 'Samutprakarn Crocodile Farm & Zoo' . A good choice as it turned out as it was one of the most interesting zoo visits I have had in a long while. That’s not to say the zoo was good or state of the art but rather that it was interesting in a number of ways. I did a deal with a taxi driver to take, wait and return. I toyed with the idea of hunting out some other people to join me but in the end gave that a miss. The drive there was uneventful and there was much to see outside of the windows. Entering into Samutprakarn I was surprised at the number of dogs there were sleeping under cars. It was as if there was some sort of rule that dogs must sleep under cars. There were at least a couple of dozen of them. It cost 300 Baht to get into the collection. My interest had already been stimulated by the advert for a 'Wild Bore' (sic), as this conjured up all sorts of comical pictures in my head. I wondered if it perhaps, applied to me at times. The mainstay of this collection is crocodilians so I will start with them. The adverts say the farm was established in 1950 and that there are over 60,000 crocodiles of 20 different species. "some of them no longer in existence elsewhere" (sic). Now if they said there was a hundred thousand I would believe them. I have never seen so many crocodiles anywhere. It was quite astounding. As to species, well I don't know because there are hybrids here and not a single one of the numerous enclosures I saw had a label on it. Except for the freaks that is. Here there were the Six legged crocodile, the Sea-lion tailed crocodile, the Halloween Masked crocodile, the Twisted crocodile, the Hump Backed crocodile and numerous others. Because there were signs here the people viewing these unfortunate creatures actually thought they were viewing species! This I know from following a English speaking Indian family, an English Thai couple and a mixed race English speaking tour group. So on the observing crocodiles in pens front there was absolutely negative educational value. Pity because it is an opportunity to do and contribute so much and it could be done quickly, easily, and cheaply. I am sure this place could afford to purchase ready made signs from other collections. I believe it is both sad and criminal that this is not being done. You would think that in 56 years of existence that they could have got it just halfway right. As to the way the crocodiles are kept. I haven't any problems here. Mostly there was enough room, the enclosures were as clean as or cleaner than one would expect and, for the most part, most looked well nourished. I noted a few tailless animals and had the opportunity to examine them closely. The animals here had been born that way unlike the amputees I saw at the horrific farm in Sim Reap, Cambodia. One of the biggest claims to fame in Samutprakarn is that it holds the worlds largest captive crocodilian. This is an Estuarine/Siamese hybrid called 'Yai' (born 1972) which measures 19ft 8in in length and weighs 1114.27 Kg! Now I don't know if I actually saw 'Yai' but I did see several of the most ginormous beasts ever. To get an idea of size get three big men to lie in a line head to toe on the pub floor and then add some inches. That big! As can be expected there is a crocodile wrestling show and a crocodile jumping show. 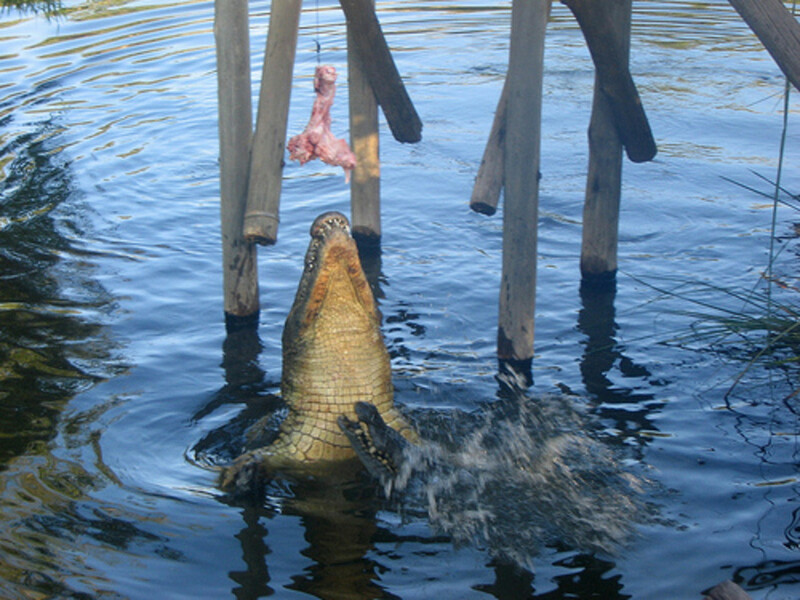 You can purchase crocodile meat and fill yourself with crocodile soup. You can buy crocodile eggs, teeth, skulls, stuffed and practically anything made from crocodile leather 'Cites permits available'. There is even a museum of sorts which has educational merit. Pity it was not better presented and with direct link to the living specimens outside. What makes it all the more of a pity is that way up there in my top five best zoo collections ever visited is the tiny Madras Crocodile Bank Trust. Samutprakarn could learn so much from them. Biggest is not best, but with a bit of work it could be. The zoo side of things is all sort of mixed up within crocodile pens though the majority is in one corner. The elephants (I saw 4) do not have an enclosure as such. They are stalled around the base of the arena in which they do shows several times a day. I watched part of a show (the usual circussy rubbish), to assess the condition of the animals. They looked pretty good to me. None of the elephants was particularly big leaving me to wonder if the show is a recent innovation (I think not) and/or what happened or where are the older animals? Lots of empty unused stalls Bit of a mystery there. I am curious to know more. There were other mysteries too. 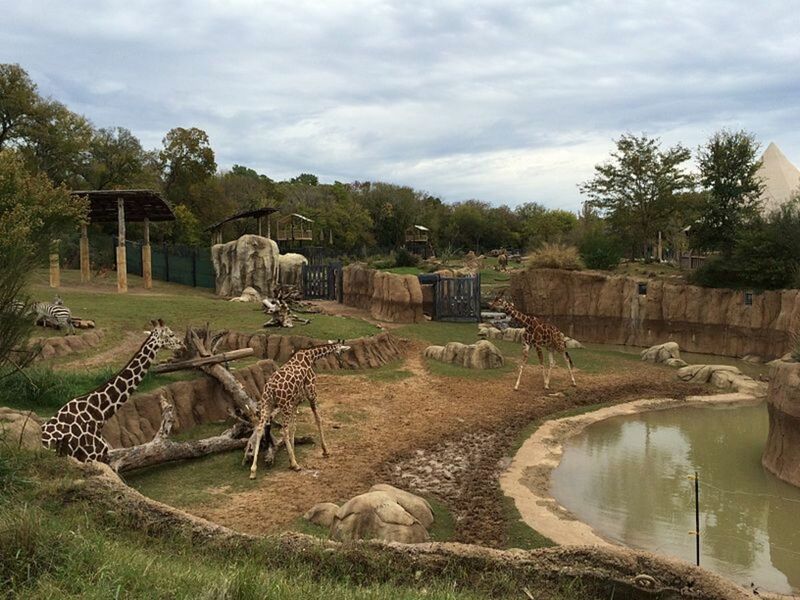 Ostriches being kept in a Giraffe house, but no sign of Giraffes. Palm Civets? Yes there were a few. Not one in a perfect enclosure and some housed better than others. As always the rule applies and can be carried round to the rest of the species held. 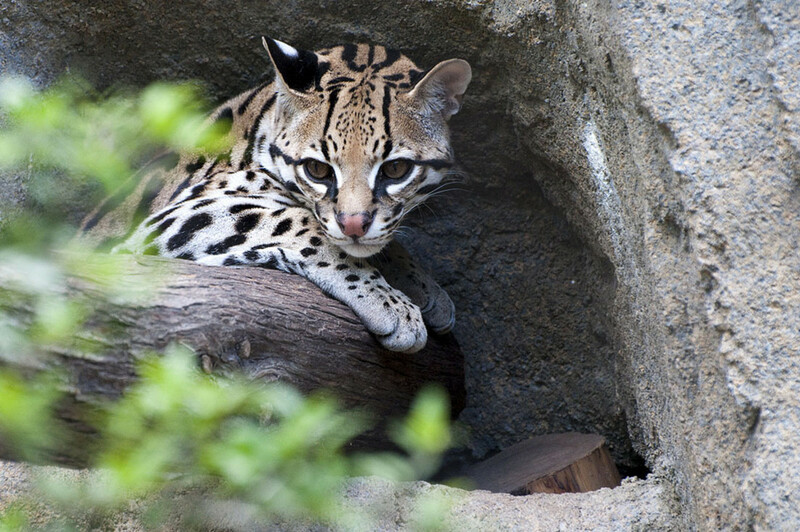 For the life of me I can't see how the staff can't see that if there is a single little post in an enclosure and the palm civet sleeps on the top of that that there isn't just a bit of a clue, a hint that is what it wants and needs. There were a couple of Gibbons in a totally inadequate cage housed next to one of the Masked Palm Civets. The Palm Civet was grooming the Gibbon through the wire. I watched this for a while. It was clearly a regular activity which both animals enjoyed. I wondered if the Gibbon groomed the Civet in return. The biggest amount of money which has been spent here is on three large Christmas Cake enclosures for White Tiger production. Spacious, clean but over the top. In the near vicinity are two photo montages of some mulleted Westerner on an ego trip kissing a large white tiger. I don't know who he is but someone ought to have a word. ( I learned much later that this was the infamous 'Doc' Antle )This is zoo promotion in the dark ages. It is not clever. 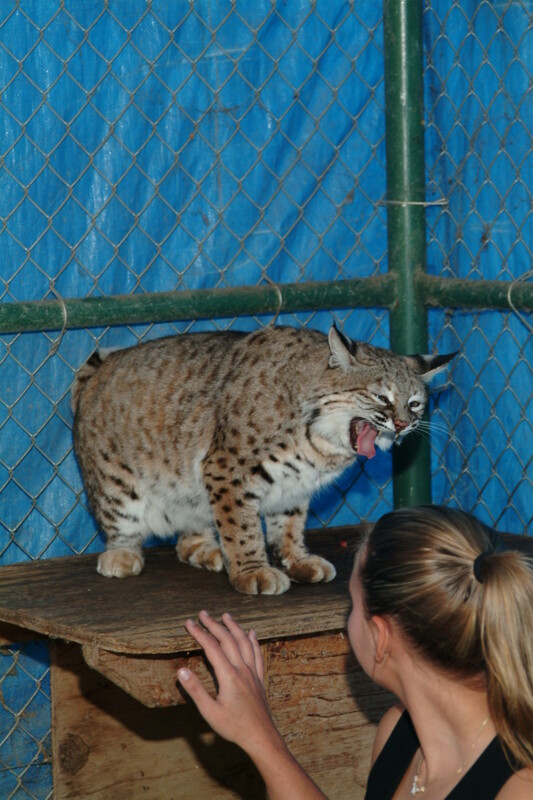 Anyone who ever hand reared a big cat could do it. There were tigers elsewhere. There was one close to the pair of Malayan Tapirs. The only thing keeping this tiger in its enclosure was thought, or rather lack of it. I know of a hundred animals that would be out in a trice. Okay, there was an overhang on the front...but what about the sides? Further across the zoo were a domestic dog, a wild boar and a tiger housed together. The boar and the dog were asleep. I have a vague recollection of reading about this some time ago. I think the dog raised the tiger and the boar, or perhaps it was the boar which raised the dog and the tiger. Whatever. Interesting, curious and unusual but of no use nor ornament and valueless within the modern zoo. This was not the only unusual mix. There was a Chimpanzee in with two Orang-utans. This group were in the region of four to five years old. There were more chimps too. A pair in one cage and then a single big female. She was built like the proverbial brick shithouse. It was perhaps because she was so big that the female of the next pair looked so slender and slight, very Bonobolike. Then there was another normal pair. Lastly there were two baby chimps in different locations acting as photographers stooges...one working with a tiger, the other with a leopard. There were a fair few Gibbons knocking about. One individual was maintained outside. A metal high tension rope stretched between two trees. The Gibbon was attached to this by a sliding ring to a chain leading to the Gibbons waist. I have seen similar lower level arrangements for dogs (and once on a guard rabbit) in back yards but never on a primate. There were a few Fuji film sponsored signs within the zoo but they were largely valueless. Apart from on some of the turtles I don't think I saw a scientific name anywhere. As well as the crocodilian and elephant shows there was a monkey show. I really dislike these things in the manner in which they are presented. They are pure animal exploitation without a scrap of educational or conservation value. In the interests of science I saw a little of each show and only confirmed my already formed opinion. The monkey show was a new one on me. Unfortunate macaques with their canines pulled and heads shaved to appear a human haircuts and dressed up to look like funny little people. Frightened little people too. These were never trained by the methods promoted by good zoos. No, this whole animal show thing stinks in the main. And who gives a damn? The main visitors at the shows I saw, the ones getting their photos taken with chimpanzees and tigers were Western tourists. Bears nearly always get the raw end of the deal. Here no less than elsewhere. Five Himalayan bears in a concrete and water enclosure. Clean? Yes! But that was it. Concrete and water. Mind numbingly, disgustingly, cruelly boring! Elsewhere there was Himalayan held alone in an equally unsuitable cage adjacent to two Sun bears which were no better off. The toilets were clean here and there were plenty of them. 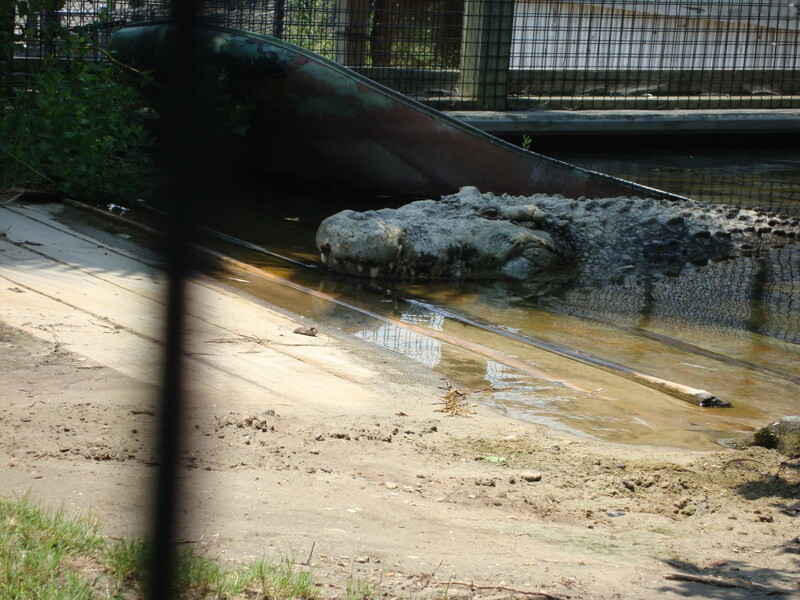 Mainly the barriers were safe (not everywhere) especially around the crocodilians. There was ample shade and abundant catering outlets. The zoo in general was neat, tidy and free from rubbish. Apart from tyres suspended on chains for the larger primates there is zilch in the way of enrichment. I doubt the concept is even known about. I think it strange that a place that is geared (apart from the farming aspect) solely towards the entertainment of Jo Public could not see that its 'inmates' might not need entertaining too. Its all very well bandying about signs like the "Conservation and Breeding Centre" (I saw maybe 500 Red-eared Terrapins here...aaaagh!) and "The Worlds Largest Garial Breeding Pond" (sic). There really needs to be proof...and I saw none. Is that the largest 'Garial' or largest pond or have they actually bred more than anyone else? No indication or clues apparent. There were few birds. Where there was the peafowl were being granted huge amounts of space and the birds of prey restricted. Can't see the logic I'm afraid. With just a little bit of jiggling about everything could end up being so much better off. Who needs loads of peafowl anyhow? It was Nice to see snakes with enough space for a change. They just lacked big and deep enough bathing facilities. A good chunk of rough barked tree does wonders for ecdysis. The hippos were better off than many. A family group of four in a very clean small enclosure. Only one Binturong. That surprised me. Only one Small-Clawed Otter in a tiny enclosure...at least it had a pool though. I thought I heard another in a private area. One Fishing cat. There appears to be only one in Dusit zoo too. I don't know about the sexes of either but common sense suggests that someone should be looking at the situation. But then again perhaps they already have done. 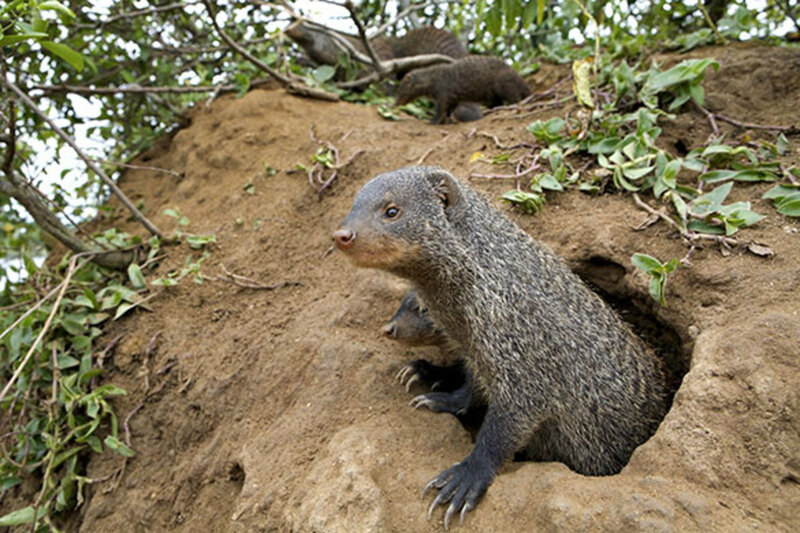 Porcupines, Cassowary, Golden Cat, Javan Mongoose, Mouse Deer, Pheasants, Elds Deer, Wild Boar, Night Herons and more. Not forgetting 'Snow Al'. Outside and across the zoo was a huge building called the 'Holy Monkey Palace'. I was told it was a Chinese Temple. Sadly it was closed or I would have investigated further. My driver took me on an extended but quicker route back to Bangkok. For a fair while we passed alongside canals. There were numerous Chinese fishing nets in place along the banks. First time (or is it?) I have seen them in use in fresh water. What also made these different was that they had an electric light 'lure' fitted dead centre above the dipping net. It would have been interesting to see one of these at work, and to see what they caught. Over the months of travel I have passed several Spirit House dumps where dozens of houses along with all their little statues and paraphernalia are discarded at the side of the road. Today I saw the biggest ever. There must have been hundreds. My taxi driver explained (as best as I could understand) that the houses were broken and that a monk had moved the spirits into a new house before the old ones were brought here. The King of Thailand gets out of hospital today. The roads leading to the palace at Dusit were massed with people waiting in anticipation of his arrival. This was really slowing traffic in the city. In the afternoon I spent some time watching the Thai boxers in training. I know there was lots of padding but it still hurt. And I wasn't participating. You may recall my mention of 'The Mud' a few weeks ago. No mention of it in Bangkok papers but the last thing I heard was that is was being looked upon as a blessing rather than a curse. Local people have discovered that it is ideal for brick manufacture. In fact it is better than the usual available mud. The farmers are diversifying and reaping the profits. If you have enjoyed reading this article you should check out my HubPage Profile and look at some of my other Hubs. 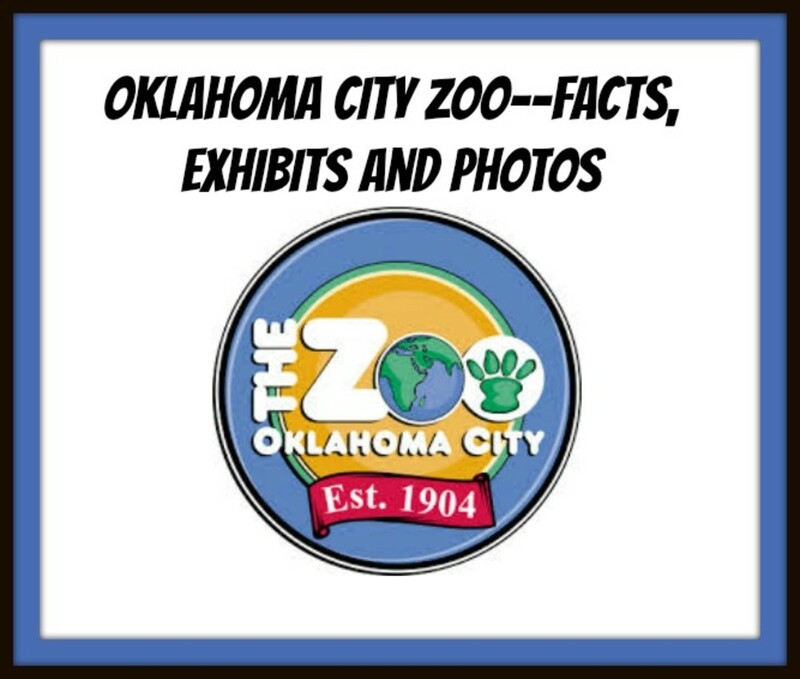 Please also check out my blog Zoo News Digest. Thanks Carmen. There really needs to be some international legislation on zoos based upon the five freedoms. You write from your heart, I will definitely read more. Very good hub. On one hand I love zoos, but on the other so many are too small and unkept. It is such a shame. One thing I really loved about this hub was 'ginormous' LOL I thought I was the only one that used that. dohn121 - Sadly it is a very much a tourist thing. When abroad all the rules go out of the window. They will ride three to a motorcycle with kids or babies in arms and not one of them with a safety helmet. They ignore red flag warnings on beaches. Lie in the sun till they fry. 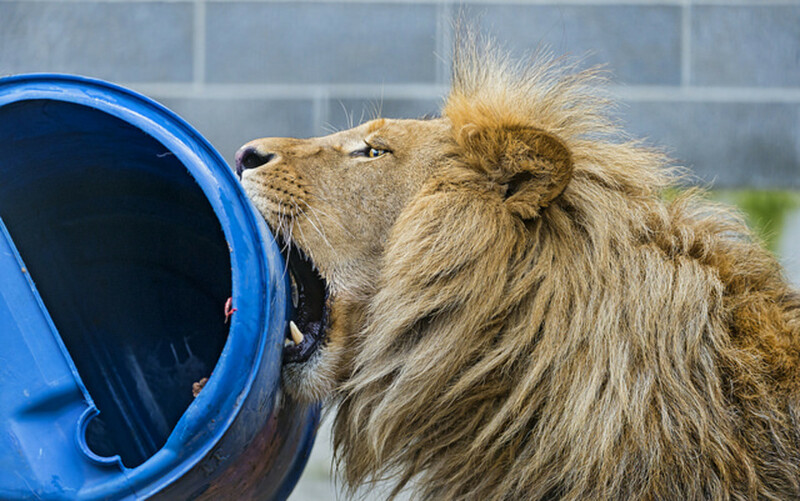 Believe sales pitches....they lose their heads. Just like you, I absolutely hate it when animals are exploited. That crocodile show is a complete travesty and if people shared the same sentiments, these shows would receive no fanfare whatsoever...Thanks again, Peter. As far as I know, the gharials( amazing very large Tomistoma) have been recently moved to another place, which is in fact a conservation breeding farm and not open to the public. Around 1.000 Tomistoma have been bred there since 1999. Its a bit sad for Samutprakarn visitors,I know,but a much better place for the crocs.